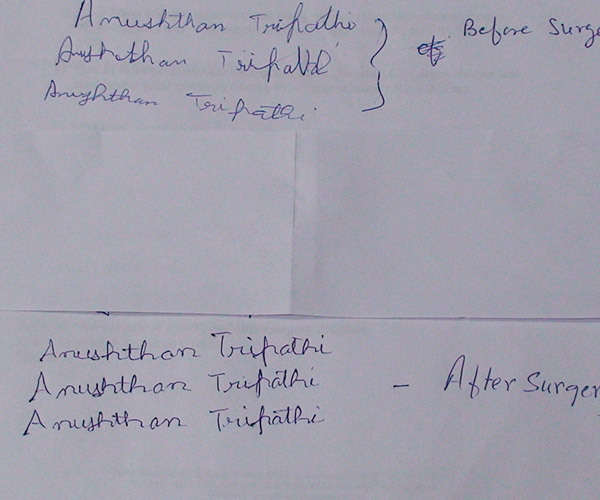 HP 47/M, head clerk by profession approached to us with difficulty in writing with his right hand since last 12 years. His symptoms gradually progressed and at present he had severe cramping of his hand involving thumb, middle & index finger with abnormal posturing. It was associated with severe pain. This was brought on by attempt to write. He was treated conservatively without any relief of his symptoms. Meanwhile he learned to write with his left hand as he had to continue his profession as clerk; but of late his left hand has also been developing similar symptoms. On examination he was neurologically well preserved without any deficits. On making him write (TASK SPECIFIC) he developed dystonic posturing of his elbow, wrist, thumb, middle & index finger. He had difficulty in holding the pen and the grip on it was weak. The written words were unclear and speed of writing slow. MRI Scan was normal. Ventro-oralis anterior nucleus of thalamotomy was performed using Radio Frequency Thermo-coagulation under Stereotactic conditions. Test lesions were performed before making a definite lesion to assess the improvement and development of any side effects. Two lesions were performed. There was an instantaneous improvement in his dystonia. and grip on the pen improved. Pain and dystonic posturing of his elbow, wrist & fingers subsided and there were no complications. AT 15/M, college student of std. XII had been suffering from a form of dystonia called writer’s cramp. He had been falling grades and was getting depressed with increasing difficulties in daily activities also. The most marked symptom was abnormal posturing of right hand on performing specific tasks. On examination he was neurologically well preserved without any deficits. On making him write (TASK SPECIFIC) he developed dystonic posturing of his elbow, wrist, thumb, middle & index finger. 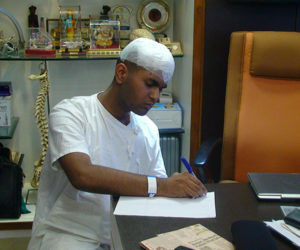 He had difficulty in holding the pen and the grip on it was weak. The written words were unclear and speed of writing slow. He had no difficulty in walking or other side of the body. MRI Scan was normal. Gpi deep brain stimulation was performed using on one side. Test stimulation was performed whilst the patient was fully awake and cooperative to identify the write spot with maximal improvement and minimal side effects. There was an instantaneous improvement in his dystonia on the operating table itself. Post operatively he could write well and the written words were clear. His speed of writing and grip on the pen improved. Pain and dystonic posturing of his elbow, wrist & fingers subsided and there were no complications.